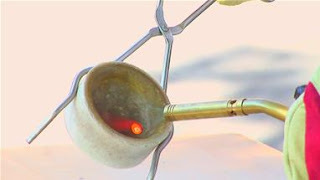 There are three methods of melting the gold. With the help of coal, we can melt 1 gram to 10 kgs gold. You should know, how to make coal stove. First of all you have to make the brick walls of stove. You have to keep empty space in the center of this stove. We send the coal from below side of this stove. When coal will totally be fired, we take a small Cupel and keep solid gold in it. We carry it on the coal stove. We give Boracic to the gold which is in the cupel. When we see its color red on the fire, it means it is melt by fire. Following way is given in the picture. Through LPG Gass stove, we can melt the gold. No Comment to " How to Melt Gold "